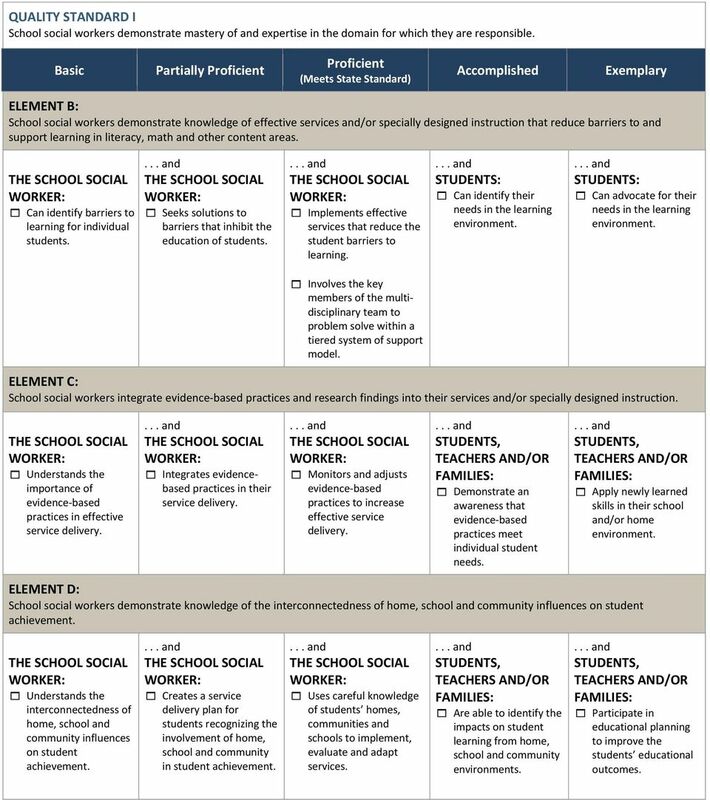 Download "2015-16 Rubric for Evaluating Colorado s Specialized Service Professionals: School Social Workers"
1 Rubric for Evaluating Colorado s Specialized Service Professionals: School Social Workers Definition of an Effective School Social Worker Effective school social workers are vital members of the education team. They are properly credentialed and have the knowledge and skills necessary to provide social-emotional and behavioral supports through prevention, intervention and crisis response efforts. 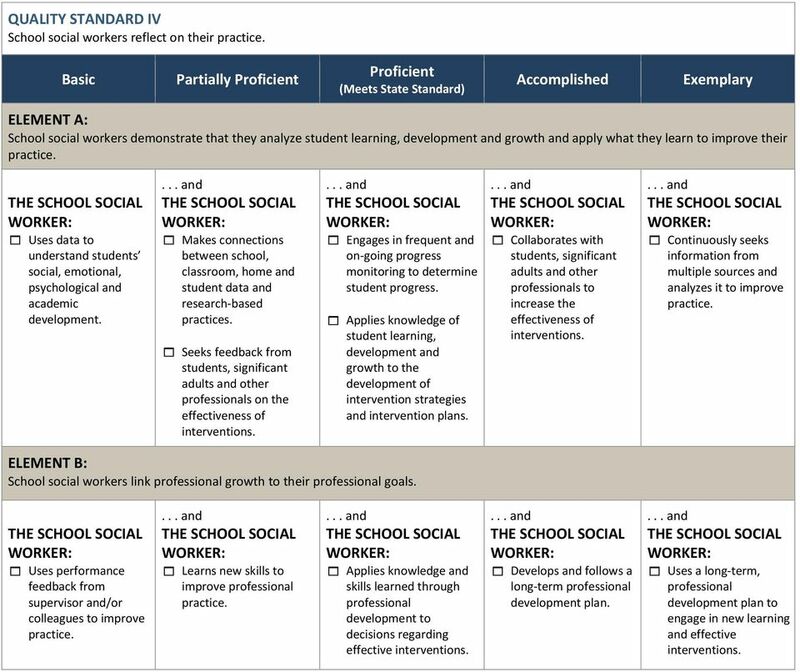 Effective school social workers strive to support growth and development in the least restrictive environment, close achievement gaps and prepare diverse student populations for postsecondary and workforce success. Effective school social workers employ and adjust evidence-based strategies and approaches to meet the unique needs of their They develop interventions and provide services that reflect the reciprocal nature of home, school and community influences on student achievement by communicating and collaborating with students, families and staff. 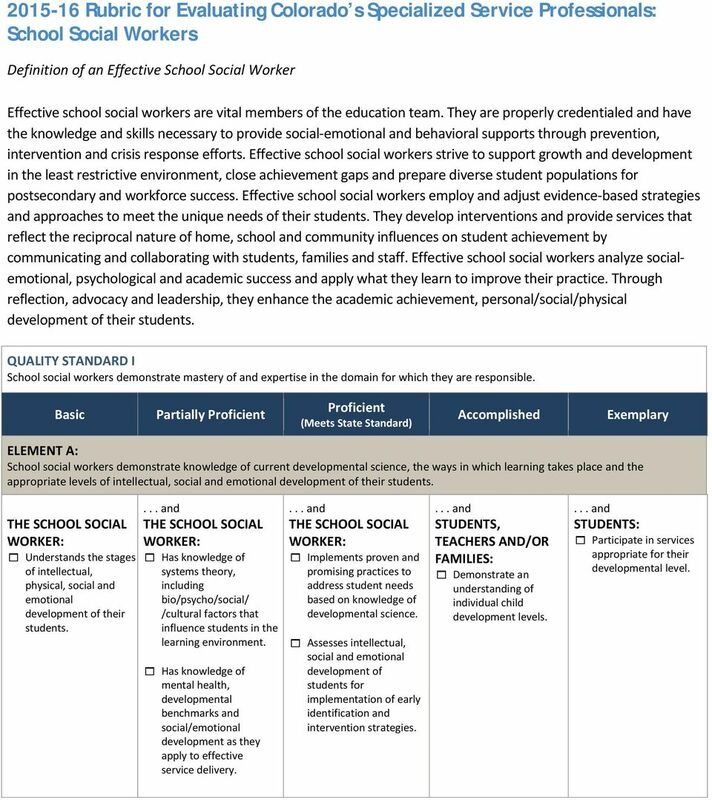 Effective school social workers analyze socialemotional, psychological and academic success and apply what they learn to improve their practice. 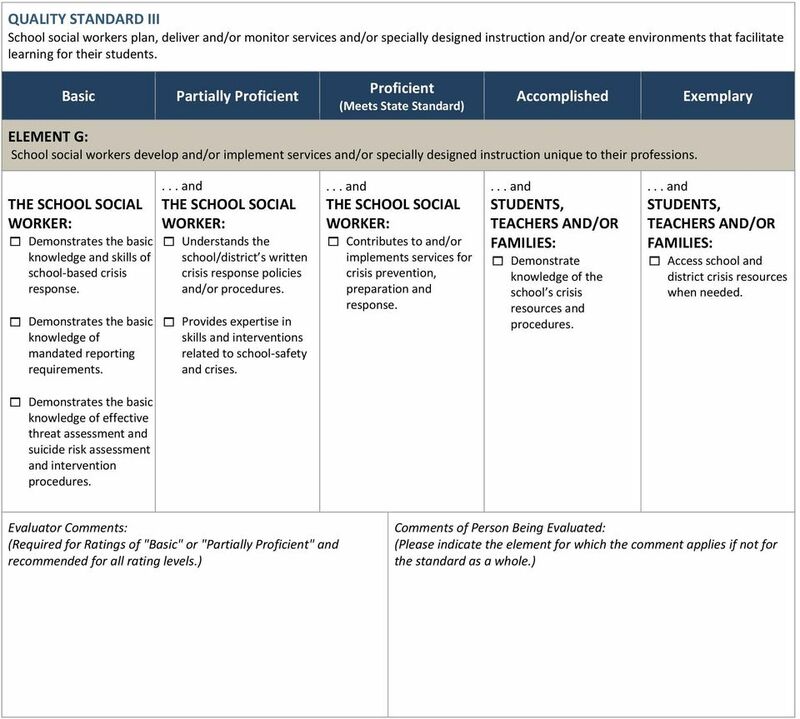 Through reflection, advocacy and leadership, they enhance the academic achievement, personal/social/physical development of their QUALITY STANDARD I School social workers demonstrate mastery of and expertise in the domain for which they are responsible. Partially ELEMENT A: School social workers demonstrate knowledge of current developmental science, the ways in which learning takes place and the appropriate levels of intellectual, social and emotional development of their stages of intellectual, physical, social and emotional development of their Has knowledge of systems theory, including bio/psycho/social/ /cultural factors that influence students in the learning Has knowledge of mental health, developmental benchmarks and social/emotional development as they apply to effective service delivery. Implements proven and promising practices to address student needs based on knowledge of developmental science. Assesses intellectual, social and emotional development of students for implementation of early identification and intervention strategies. Demonstrate an understanding of individual child development levels. Participate in services appropriate for their developmental level. 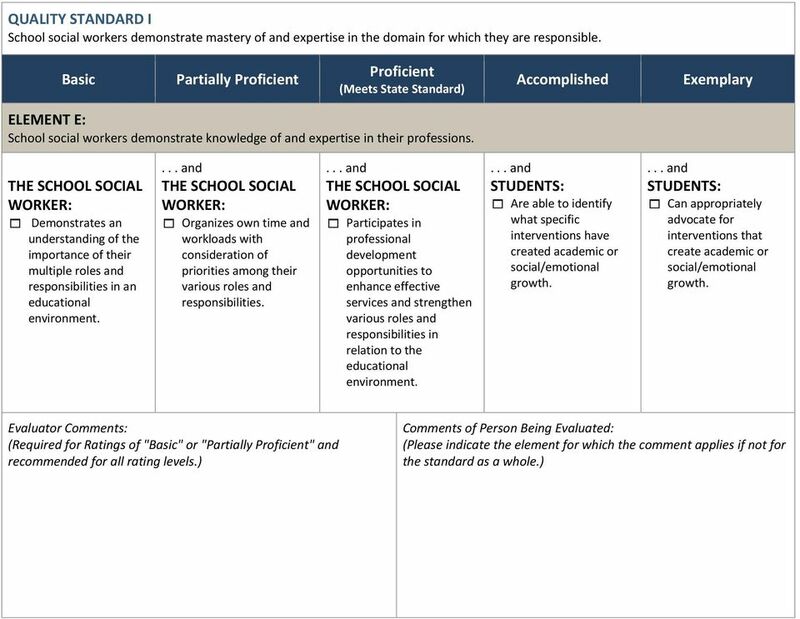 2 QUALITY STANDARD I School social workers demonstrate mastery of and expertise in the domain for which they are responsible. 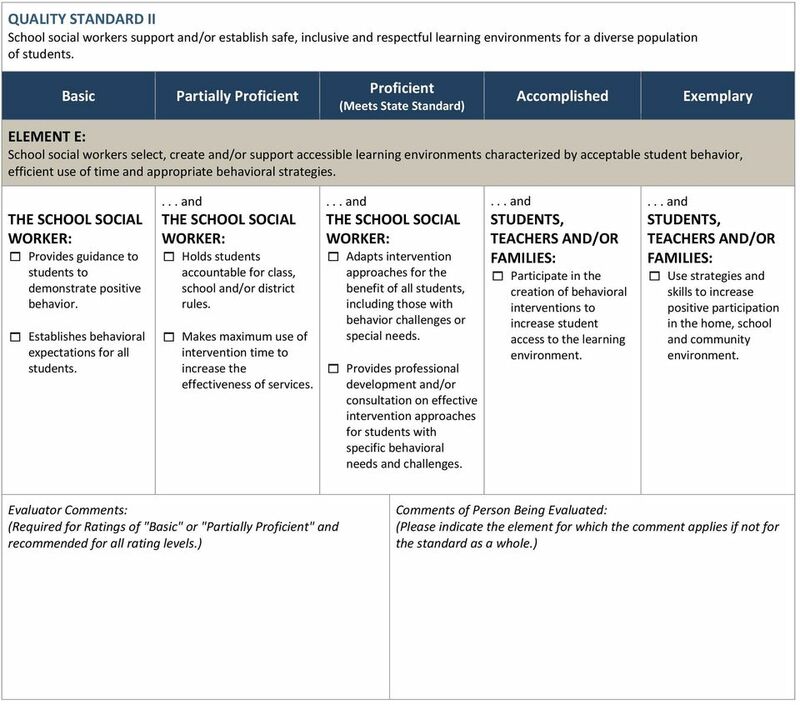 Partially ELEMENT B: School social workers demonstrate knowledge of effective services and/or specially designed instruction that reduce barriers to and support learning in literacy, math and other content areas. Can identify barriers to learning for individual Seeks solutions to barriers that inhibit the education of Implements effective services that reduce the student barriers to learning. Can identify their needs in the learning Can advocate for their needs in the learning Involves the key members of the multidisciplinary team to problem solve within a tiered system of support model. 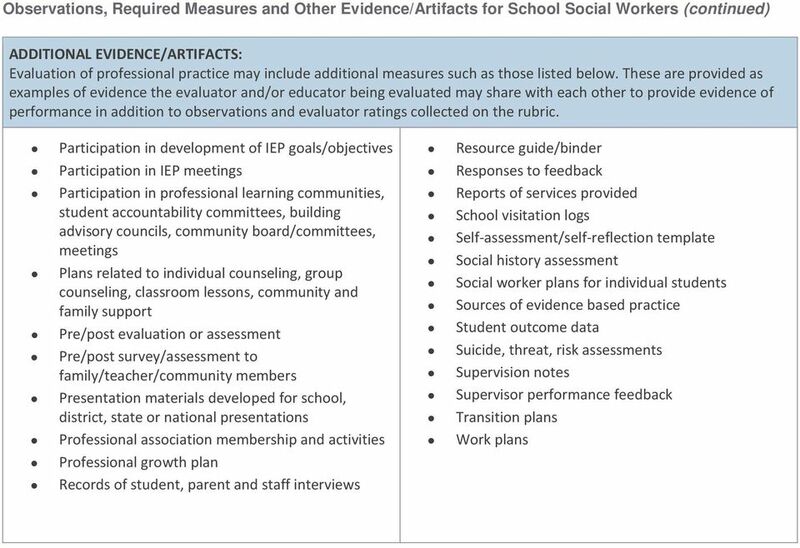 ELEMENT C: School social workers integrate evidence-based practices and research findings into their services and/or specially designed instruction. importance of evidence-based practices in effective service delivery. Integrates evidencebased practices in their service delivery. Monitors and adjusts evidence-based practices to increase effective service delivery. Demonstrate an awareness that evidence-based practices meet individual student needs. Apply newly learned skills in their school and/or home ELEMENT D: School social workers demonstrate knowledge of the interconnectedness of home, school and community influences on student achievement. interconnectedness of home, school and community influences on student achievement. Creates a service delivery plan for students recognizing the involvement of home, school and community in student achievement. Uses careful knowledge of students homes, communities and schools to implement, evaluate and adapt services. Are able to identify the impacts on student learning from home, school and community environments. Participate in educational planning to improve the students educational outcomes. 7 QUALITY STANDARD III School social workers plan, deliver and/or monitor services and/or specially designed instruction and/or create environments that facilitate learning for their Partially ELEMENT A: School social workers provide services and/or specially designed instruction aligned with state and federal laws, regulations and procedures, academic standards, their districts organized plans of instruction and the individual needs of their Understands legal requirements for professional practices. Demonstrates understanding of individualized education programs, 504 plans and other federal/state/local practices. Participates in the development of individualized education programs, 504 plans and other federal/state/local practices. Provides services which are individualized and aligned with legal and district requirements. Modify and adapt services related to individualized education programs, 504 plans and other federal/state/local practices. Collaborates with stakeholders around federal/state/local practices to individualize services for STUDENTS AND/OR Understand their educational rights. TEACHERS AND/OR Utilize materials, strategies and/or interventions to support individualized learning. 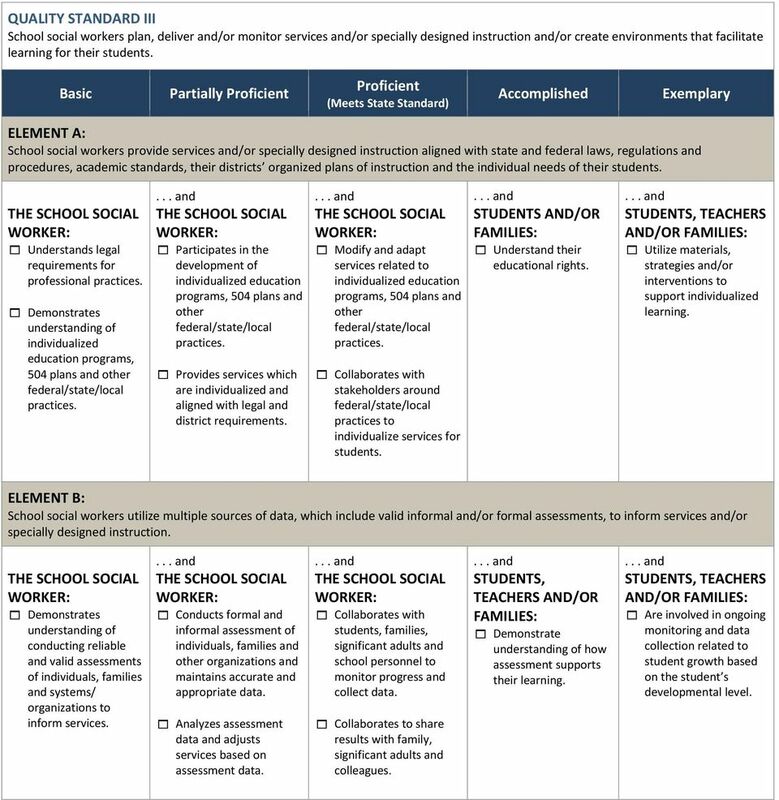 ELEMENT B: School social workers utilize multiple sources of data, which include valid informal and/or formal assessments, to inform services and/or specially designed instruction. Demonstrates understanding of conducting reliable and valid assessments of individuals, families and systems/ organizations to inform services. Conducts formal and informal assessment of individuals, families and other organizations and maintains accurate and appropriate data. Analyzes assessment data and adjusts services based on assessment data. 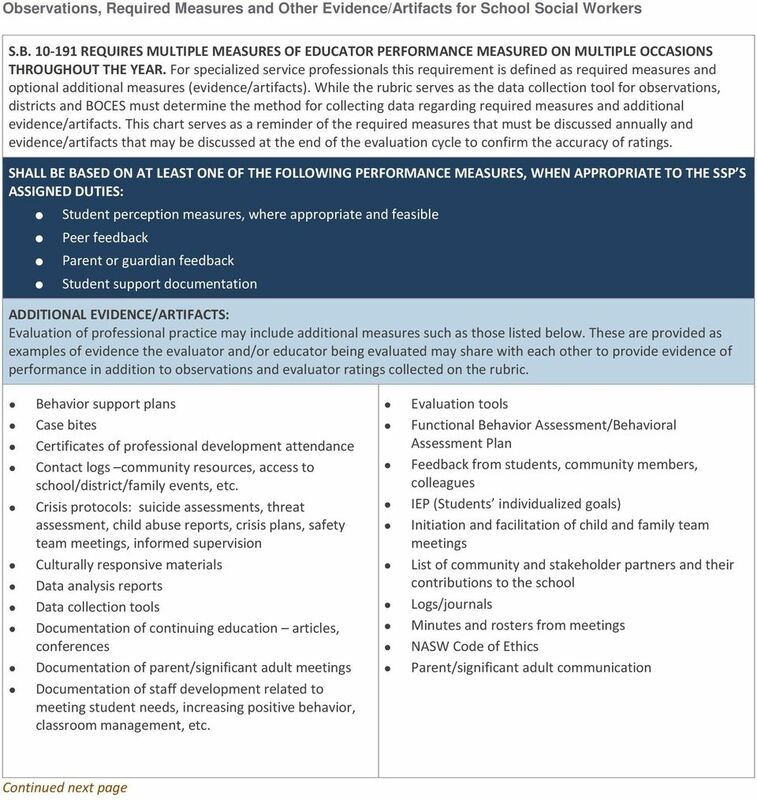 Collaborates with students, families, significant adults and school personnel to monitor progress and collect data. Collaborates to share results with family, significant adults and colleagues. Demonstrate understanding of how assessment supports their learning. TEACHERS AND/OR Are involved in ongoing monitoring and data collection related to student growth based on the student s developmental level. 8 QUALITY STANDARD III School social workers plan, deliver and/or monitor services and/or specially designed instruction and/or create environments that facilitate learning for their Partially ELEMENT C: School social workers plan and consistently deliver services and/or specially designed instruction that integrate multiple sources of data to inform practices related to student needs, learning and progress toward achieving academic standards and individualized student goals. Understands how data should inform and impact services. importance of integrating data from multiple sources. Uses data to develop, provide and integrate effective services that are developmentally appropriate. Understands how to monitor student progress toward achieving individualized student goals. Develops findings from the data analyzed and shares results with students, families and colleagues. Integrates data from multiple sources to deliver and improve services. Review and reflect on data collected in order to monitor progress toward achieving individualized student goals. 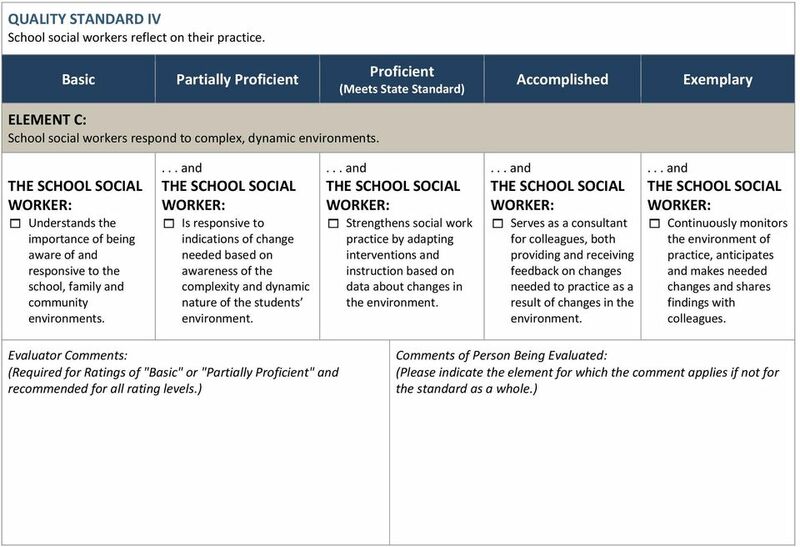 Use interventions designed to improve progress toward achieving individualized student goals. 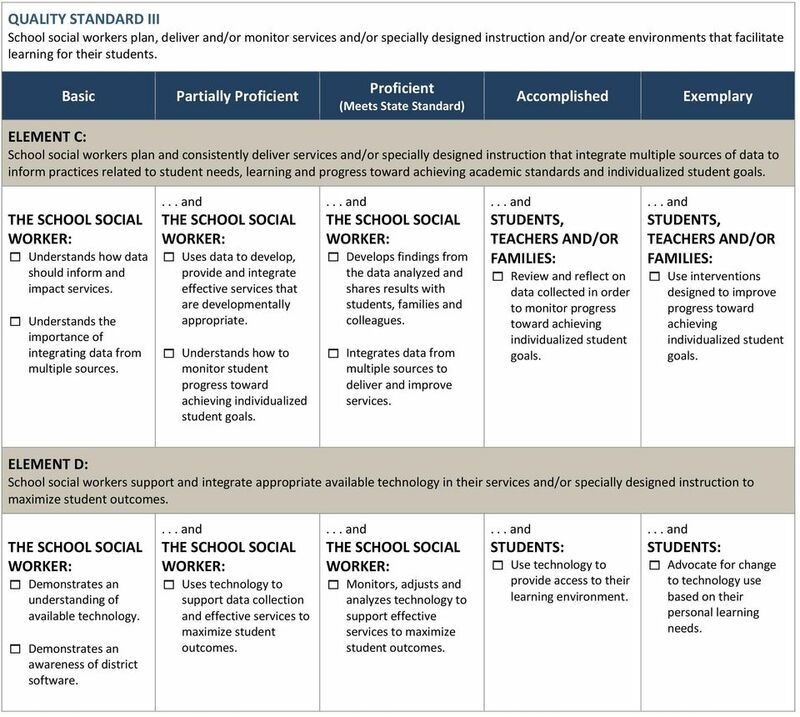 ELEMENT D: School social workers support and integrate appropriate available technology in their services and/or specially designed instruction to maximize student outcomes. Demonstrates an understanding of available technology. Demonstrates an awareness of district software. Uses technology to support data collection and effective services to maximize student outcomes. Monitors, adjusts and analyzes technology to support effective services to maximize student outcomes. Use technology to provide access to their learning Advocate for change to technology use based on their personal learning needs. 9 QUALITY STANDARD III School social workers plan, deliver and/or monitor services and/or specially designed instruction and/or create environments that facilitate learning for their Partially ELEMENT E: School social workers establish and communicate high expectations for their students that support the development of critical-thinking, self-advocacy, leadership and problem solving skills. Has high expectations for all Understands that students need to employ critical thinking, self-advocacy and problem solving skills. Incorporates selfadvocacy, critical thinking and/or problem solving skills into lessons and/or interventions. 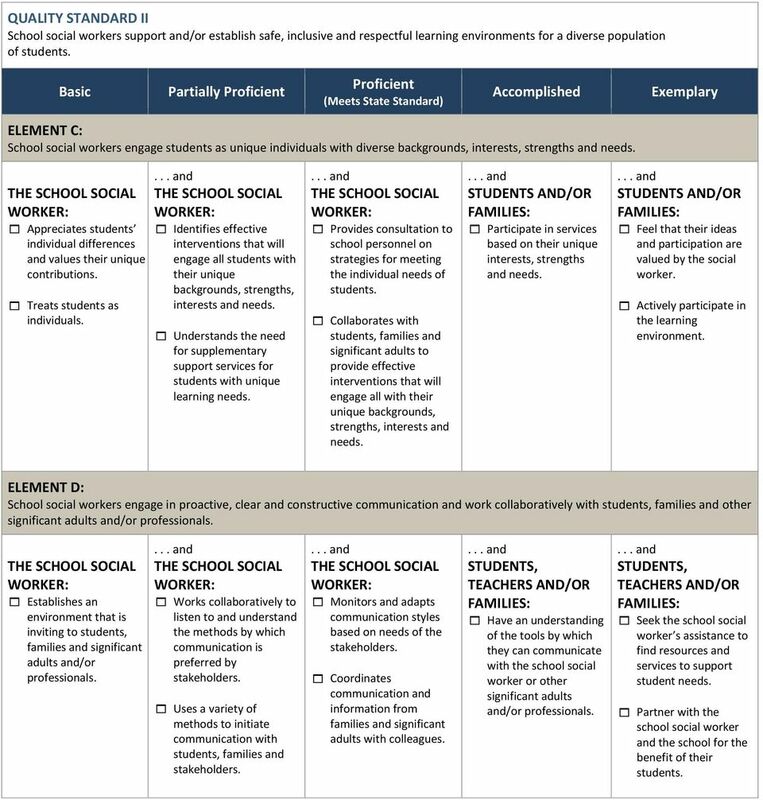 Collaborates with team members to determine appropriately high expectations for Sets student expectations at a level that challenges students and communicates high expectations with school staff and significant adults. Systematically and explicitly teaches selfadvocacy, critical thinking and/or problem solving skills. Monitor student progress towards achieving social/emotional goals and expectations. Demonstrate selfadvocacy, critical thinking and problem solving skills based on their developmental level. ELEMENT F: School social workers communicate effectively with importance of developing effective and individualized communication systems. Demonstrates effective listening skills. Develops effective and individualized communication systems in collaboration with Adjusts communication style to meet the individual needs of Models effective communication skills. Provides students with feedback related to behavior, performance and/or progress. Use feedback to enhance student learning and growth. Demonstrate effective communication related to their needs. 11 QUALITY STANDARD IV School social workers reflect on their practice. 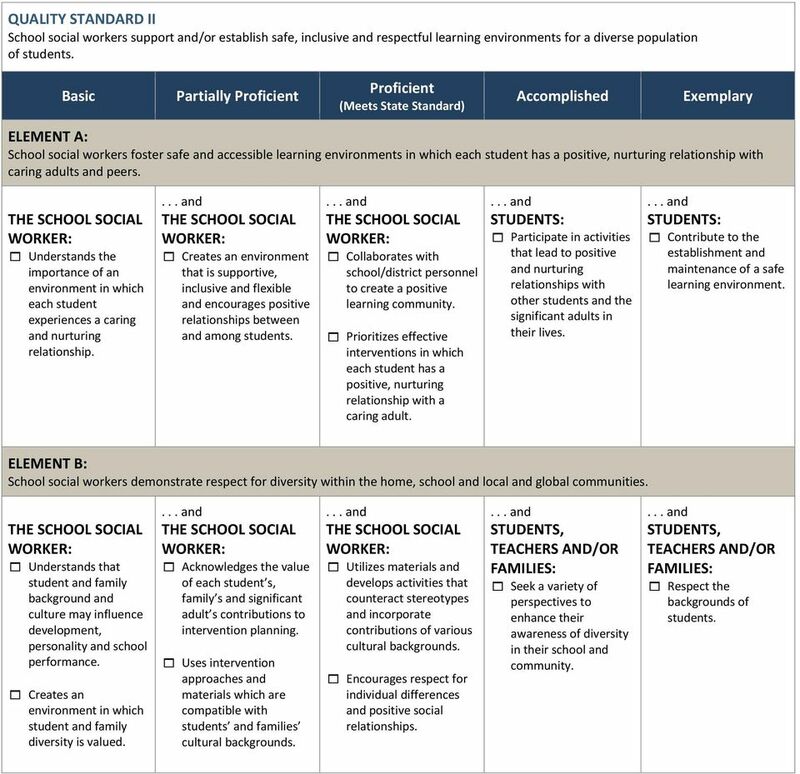 Partially ELEMENT A: School social workers demonstrate that they analyze student learning, development and growth and apply what they learn to improve their practice. Uses data to understand students social, emotional, psychological and academic development. Makes connections between school, classroom, home and student data and research-based practices. Seeks feedback from students, significant adults and other professionals on the effectiveness of interventions. Engages in frequent and on-going progress monitoring to determine student progress. Applies knowledge of student learning, development and growth to the development of intervention strategies and intervention plans. Collaborates with students, significant adults and other professionals to increase the effectiveness of interventions. Continuously seeks information from multiple sources and analyzes it to improve practice. 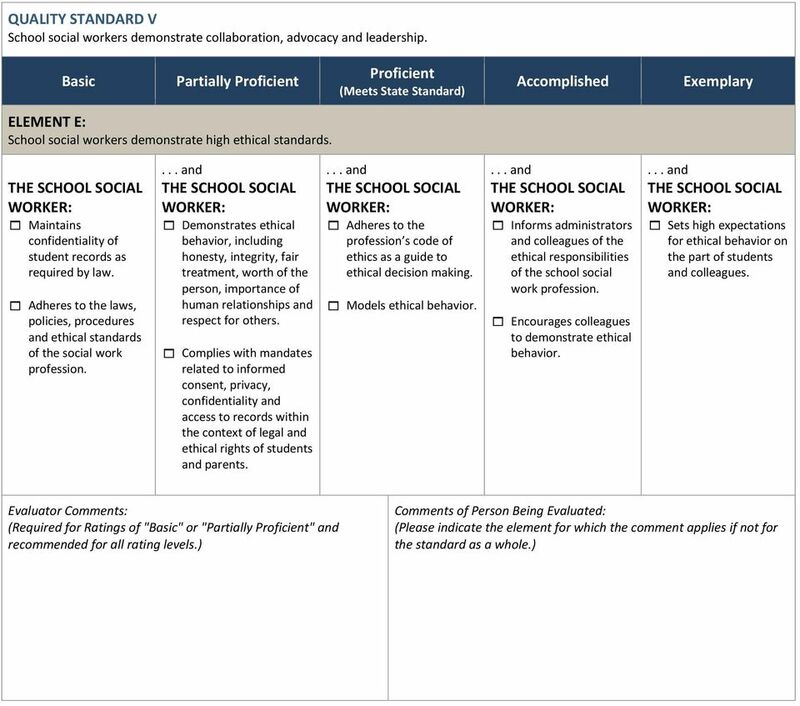 ELEMENT B: School social workers link professional growth to their professional goals. Uses performance feedback from supervisor and/or colleagues to improve practice. Learns new skills to improve professional practice. Applies knowledge and skills learned through professional development to decisions regarding effective interventions. Develops and follows a long-term professional development plan. Uses a long-term, professional development plan to engage in new learning and effective interventions. 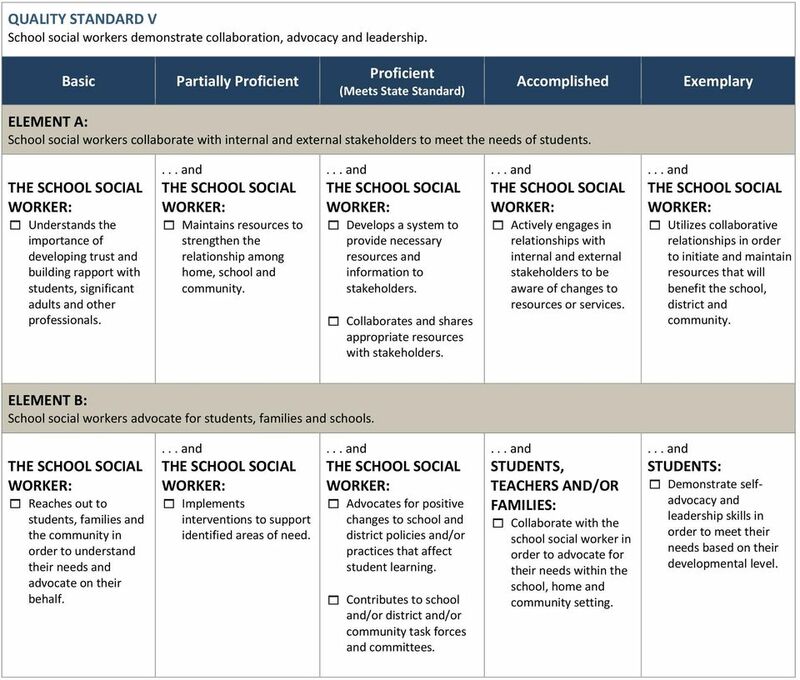 13 QUALITY STANDARD V School social workers demonstrate collaboration, advocacy and leadership. 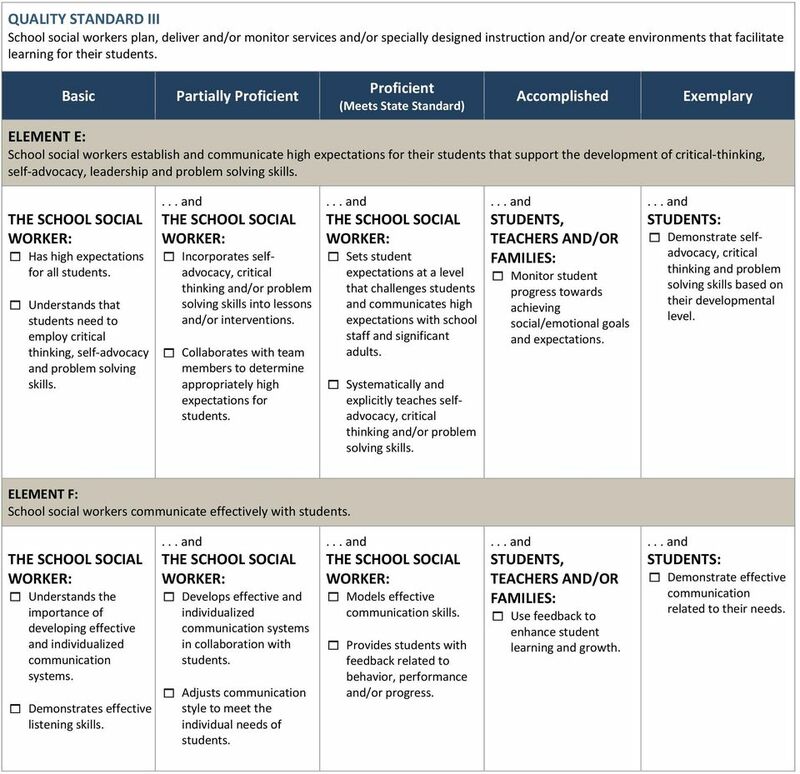 Partially ELEMENT A: School social workers collaborate with internal and external stakeholders to meet the needs of importance of developing trust and building rapport with students, significant adults and other professionals. Maintains resources to strengthen the relationship among home, school and community. Develops a system to provide necessary resources and information to stakeholders. Collaborates and shares appropriate resources with stakeholders. Actively engages in relationships with internal and external stakeholders to be aware of changes to resources or services. Utilizes collaborative relationships in order to initiate and maintain resources that will benefit the school, district and community. ELEMENT B: School social workers advocate for students, families and schools. Reaches out to students, families and the community in order to understand their needs and advocate on their behalf. Implements interventions to support identified areas of need. Advocates for positive changes to school and district policies and/or practices that affect student learning. Contributes to school and/or district and/or community task forces and committees. Collaborate with the school social worker in order to advocate for their needs within the school, home and community setting. Demonstrate selfadvocacy and leadership skills in order to meet their needs based on their developmental level. 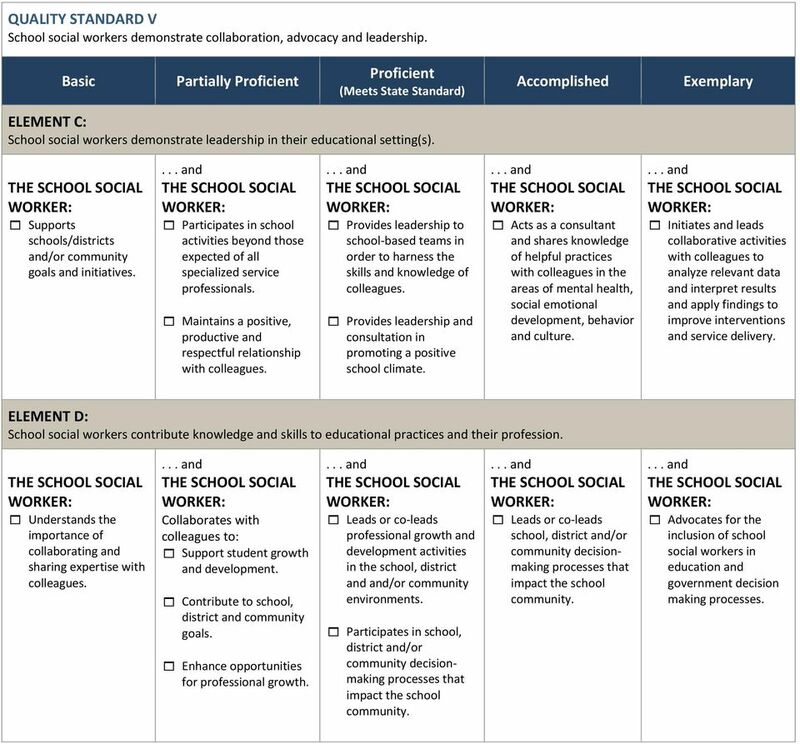 14 QUALITY STANDARD V School social workers demonstrate collaboration, advocacy and leadership. Partially ELEMENT C: School social workers demonstrate leadership in their educational setting(s). Supports schools/districts and/or community goals and initiatives. Participates in school activities beyond those expected of all specialized service professionals. Maintains a positive, productive and respectful relationship with colleagues. Provides leadership to school-based teams in order to harness the skills and knowledge of colleagues. Provides leadership and consultation in promoting a positive school climate. Acts as a consultant and shares knowledge of helpful practices with colleagues in the areas of mental health, social emotional development, behavior and culture. Initiates and leads collaborative activities with colleagues to analyze relevant data and interpret results and apply findings to improve interventions and service delivery. ELEMENT D: School social workers contribute knowledge and skills to educational practices and their profession. importance of collaborating and sharing expertise with colleagues. Collaborates with colleagues to: Support student growth and development. Contribute to school, district and community goals. Enhance opportunities for professional growth. Leads or co-leads professional growth and development activities in the school, district and and/or community environments. Participates in school, district and/or community decisionmaking processes that impact the school community. Leads or co-leads school, district and/or community decisionmaking processes that impact the school community. Advocates for the inclusion of school social workers in education and government decision making processes.